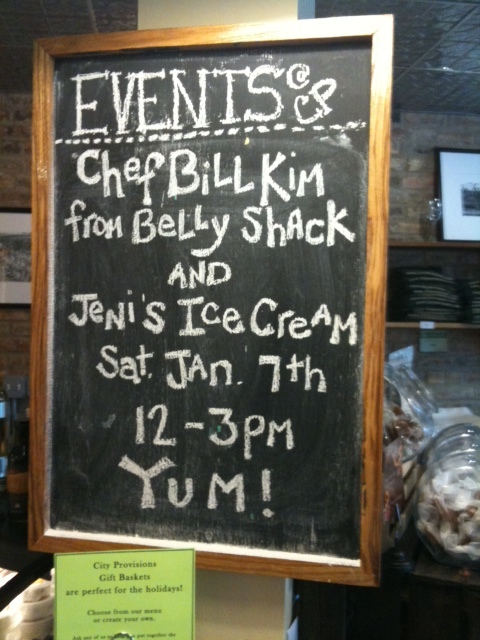 Something we saw yesterday: a sign at City Provisions announcing a Saturday afternoon tasting event featuring Bill Kim from Belly Shack (as well as Urban Belly) and Jeni’s Ice Cream from Columbus, Ohio. Does this mean we finally get to have kimchi ice cream? Even if it doesn’t, we’ll be checking out this event, since Belly Shack is our Korean + Latin food overlord, and we’ve been hearing the hype about Jeni’s Ice Cream for several years. And if we can still get a pint of Cleetus’ Slackjawed Dunkel from City Provision’s, even better. In case the sign wasn’t clear enough: Belly Shack + Jeni’s Ice Cream tasting event from 1-3 PM, Saturday January 7, at City Provisions Deli –– 1818 W. Wilson * Ravenswood.